The leader of the renegade Zeons who took refuge at the asteroid base Axis. As the daughter of the admiral who led the exodus to Axis, Haman took over her late father's role, and at age sixteen found herself in charge of this community of dispirited Zeon exiles. Despite her youth, Haman's charisma, guile, and remarkable Newtype abilities enabled her to rally the Axis refugees for their triumphant return to the Earth Sphere. While nominally just a regent to the child heir Mineva Zabi, Haman is in truth the unchallenged master of the Axis forces, who seeks to restore the Zabi dynasty in order to seize power for herself. 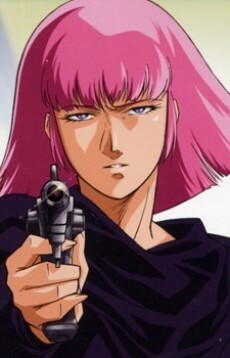 It is important to note however that Haman was not always the way she was in Zeta Gundam and Gundam ZZ. The manga Char's Deleted Affair and its mini prequel Haman's Deleted Affair, reveal that Haman had a sweet disposition as a young teenager. The latter manga reveals that Haman grew up in Axis after the One Year War, never having seen the Earth, and had to endure a hard life growing up as Axis was not well suited to support life, and it was not any better with the looming threat of the Federation possibly attacking them. The former manga also shows she was a romantic of sorts, as she became romantically involved with Zeon's Red Comet, Char Aznable. Though CDA also reaffirms what was said in HDA, as Haman had to train to be a soldier and possibly felt obligated to protect the people on Axis, viewing their treatment by the Federation as unjust. Thus Haman's personality in the anime is a result of her troubled upbringing, never having had the chance to be a child and enjoy life, Haman became dark, cold, and isolated from the rest of the world, which she states in Mobile Suit Gundam ZZ, is what made her stronger and is her strength.